“The Wickhams: Christmas at Pemberley” takes places downstairs in the servants’ work area rather than the opulent main floor in late December 1815. Also presented by MTC, their first sequel, “Miss Bennet: Christmas at Pemberley” in 2016, took place upstairs at the same time but with a different focus. The current play focuses on two relationships, one slowly blossoming, the other quickly failing. The blossoming relationship is between two servants, Brian (August Browning), the footman; and Cassie (Neiry Rojo), the newly hired housemaid. He’s an inventor who makes a reading stand for her, while she’s an independent sort who wants to make her own way in the world. On the other hand, the marriage between Lydia Wickham (Madeline Rouverol) and George Wickham (Kenny Toll) is in trouble. Lydia tries to put on a happy front, but George is despised by her family, the Bennets. They include her sister, Elizabeth Darcy (Melissa Ortiz), and Elizabeth’s husband, the wealthy Fitzwilliam Darcy (David Everett Moore), owner of Pemberley. In fact, George wasn’t invited to the holiday celebration, but one night he drunkenly arrives downstairs after suffering a beating in the local pub. The turning point comes with an incriminating letter Cassie finds in George’s jacket before she washed it. The letter proves that George is a scoundrel and that he married Lydia only for her money. 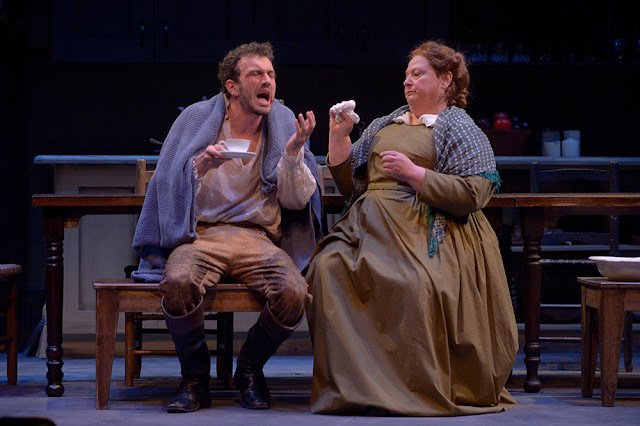 Mrs. Reynolds (Jennie Brick) patches up George Wickham (Kenny Toll). With all the goings-on downstairs as the Darcys and Lydia come there for refuge, the longtime housekeeper, Mrs. Reynolds (Jennie Brick), is the glue that holds everything together. She also makes delicious biscuits (cookies). Directed by Megan Sandberg-Zakian, the entire cast is first-rate with everyone believable in reflecting how upper- and middle-class people spoke and acted at that time. There are many amusing moments, too. The functional set is by Wilson Chin with lighting by Wen-Ling Liao and sound by Sharath Patel. The costumes, notably the elegant Regency Period dresses for Lydia and Elizabeth, are by Courtney Flores. Performances were to have begun Nov. 15 but were delayed until after Thanksgiving because smoke from the Butte County fire permeated the theater, causing a health threat. To make up for those lost performances, the show has been extended seven days through Dec. 16. It’s great entertainment. 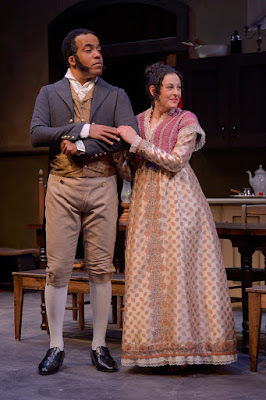 “The Wickhams: Christmas at Pemberley” runs about two hours and 10 minutes with one intermission at Marin Theatre Company, 397 Miller Ave., Mill Valley. For tickets and information, call (415) 388-5208 or visit www.marintheatre.org.